We are checking and improving this in the coming days, site was developed for screens bigger than Full HD, hence some of the discrepancies on smaller res. We will work in all the suggested points of improvement and testing/relay for smaller resolutions. Thanks for your feedback. 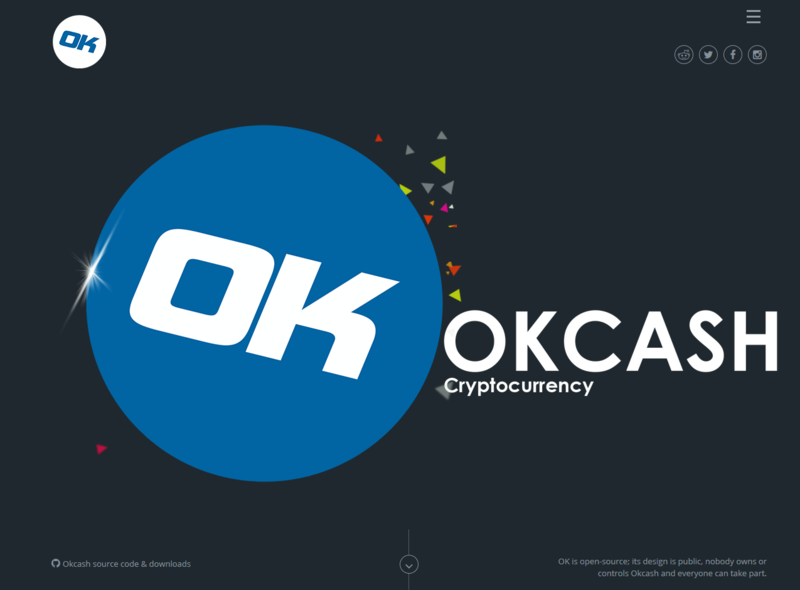 Welcome to visit the new Okcash website with the new Logo! also you will be able to find it with its vector over the Okcash-Graphics over the OK GitHub to print/use for your own needs. We love the new clean and improved logo and site! share your thoughts! 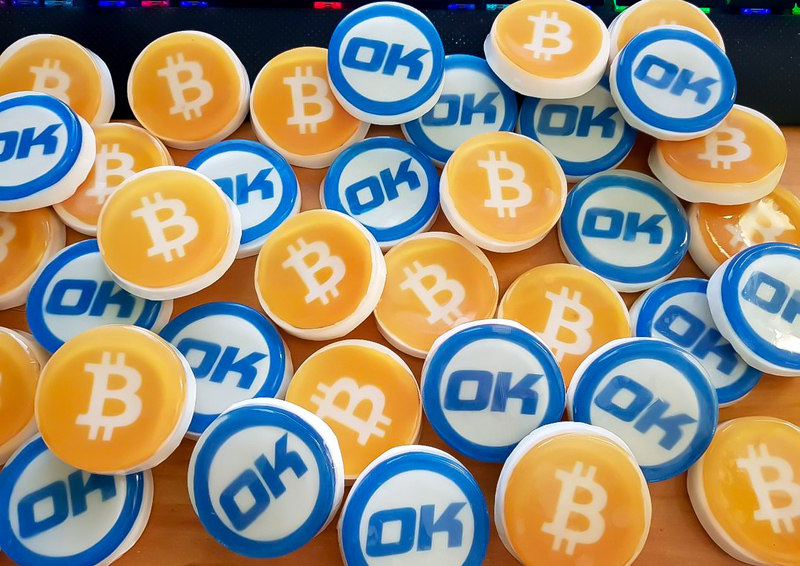 Coming Up: Okcash Collaborators Conference, Minecraft Pocket Edition Server Release, Wallets update, Tournaments and even more surprises coming up! 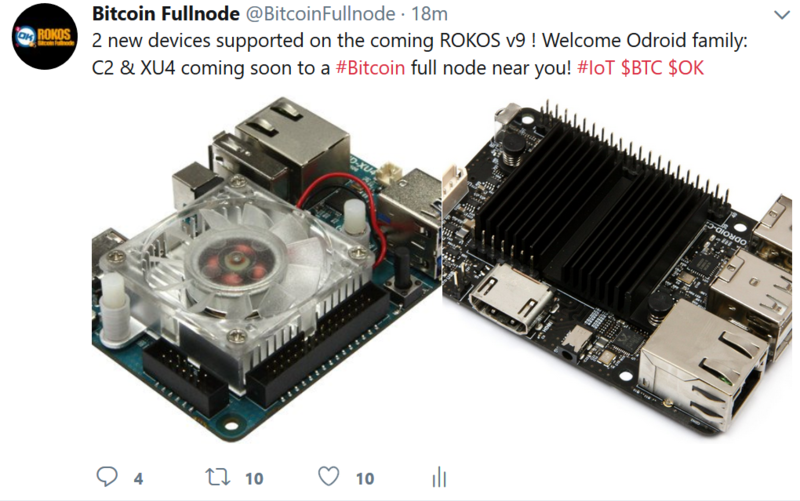 go to network section then you can see a list of hundreds of nodes, if need more help join https://discord.io/ok where we can help in live time. 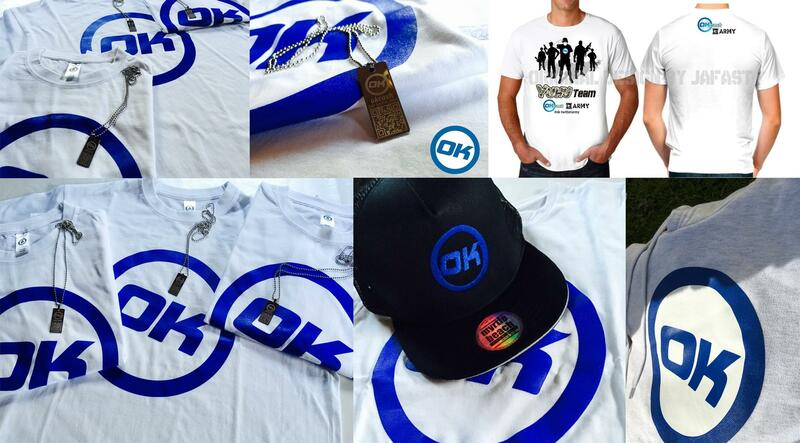 Enjoy the new site everyone can win $OK or start their own projects to benefit and have fun! 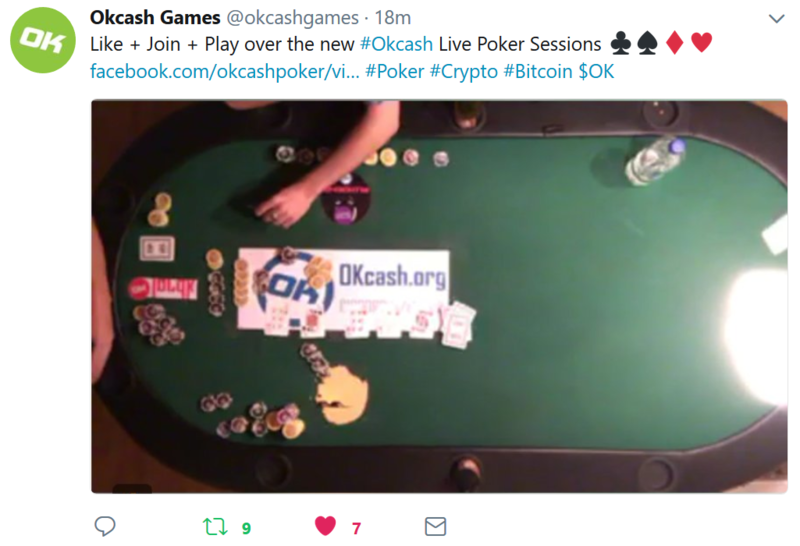 Okcash Games General / Team almost done, Okcash Games Launch in 24 hrs! Team almost done, Okcash Games Launch in 24 hrs! Also, if your coins have been there in the same address for more than a year, you need to move them to a new address. As the okcash code says, Min time 8 hrs - Max time for stake is 1 year, so after a year you just need to move to new address so counter can reset and coins can stake again. Follow the steps, start wallet and should be working, if not please play more attention to the steps and/or provide more details. so you can get those rewards, code does not lie, go read the Okcash code over github if want to learn how it works. In 8 days we get the Rebranding! This will be something amazing for us all! The marketing group has also already received the promotional material with a new logo, which will start promoting from 17/09 under the new sign! 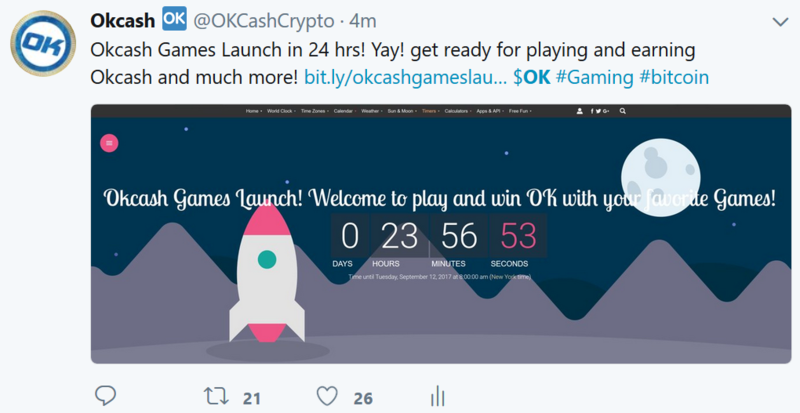 Also the Okcash Gaming website gets released in 3 days! Big changes are getting ready, stay with us, OK works for you. What is so cool about Okcash ? 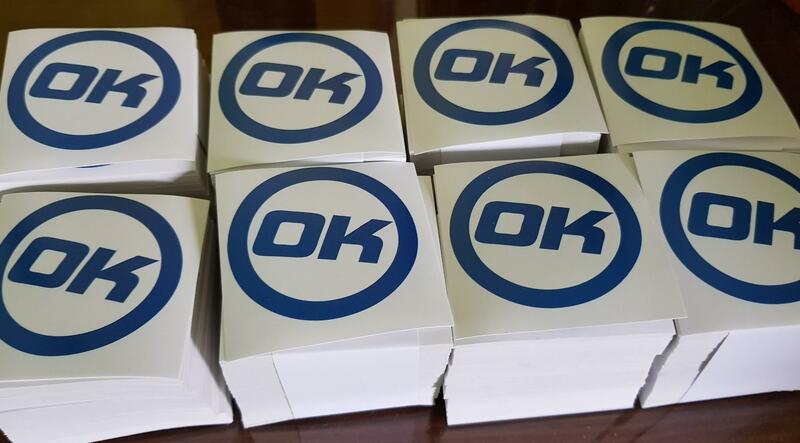 -- OK is the only coin with/and creators of the "LTSS" System (Long Term Sustainable Staking) in pair with Bitcoin Long Term Halving system, meaning the last Okcash will be staked around the year 2148. -- OK transfers virtually instant, with fast 69-74 second confirmations, without the need of special layers/masternodes/side systems. -- The OK Collaborators team is decentralized and conformed of more than 40 members from countries like: United States, Canada, Mexico, Brazil, Spain, France, Norway, Germany, United Kingdom, Indonesia, Australia, Egypt and more. -- The OK Blockchain is one of the most efficient and secure chains in crypto, being online since 2014 and working 24/7 and available anytime for all of its users. -- Everyone can participate and mine for more coins with Okcash thanks to staking, no matter how many coins you have on your wallet, you get the 10% in Okcash rewards during this year in your wallet until the next halving period. -- There will only be 105 million Okcash in existence ( 5 times the Bitcoin coin cap ) Making OK perfect also for Micro Payments / Transactions. 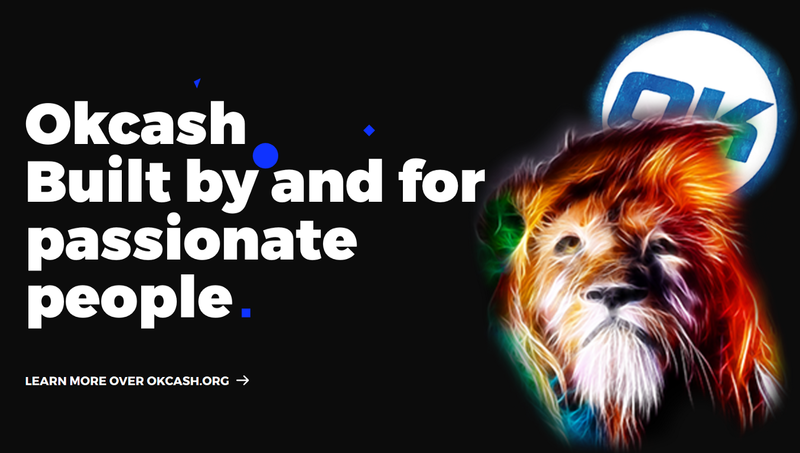 -- OK cash holds a unique name that attracts and explains itself and the project no matter the language, no cultural barriers. -- OK has one of the lowest fees in crypto. 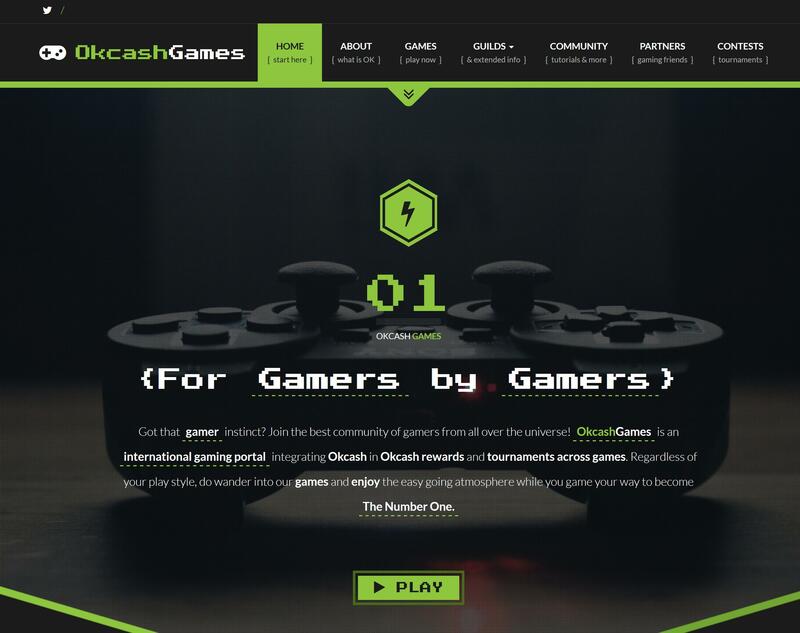 Coming "Okcash Games" gaming portal that will hold all the info about the Okcash Games, tournaments on different games, the links and info about different Okcash Games Servers (like minecraft, etc) Where the same community will be able to add/manage their own servers ripping all the benefits themselves as well, Only requirements for new servers to get added is that they have to either work with Okcash cryptocurrency within the game/server and/or hold Okcash contests for its users. 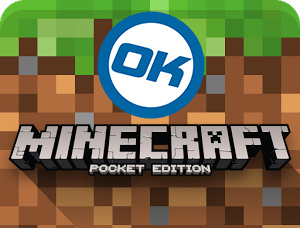 New game server coming up: the new Minecraft Pocket Edition ( for mobile users) , the platform will also hold info/links for the different Okcash Guilds in different games people play. 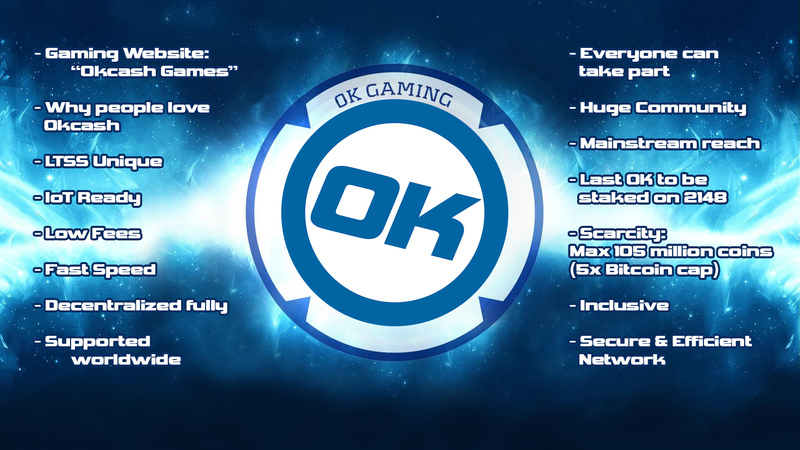 In the future, after establishing a good user base, Okcash Games (Collabs + Community) will be creating/coding their own Games that use Okcash as part of their economy/game for different platforms. ~The place for gamers by gamers. 17/09 -- REBRANDING -- New Logo (v3) -- Website Redesign + more OK info sites coming up! 19/09-20/09 -- open online conference for the community by some of the OK collaborators and strong community members. We will talk about some of the future plans, the stock exchanges that show interest in the project, potential developers with whom we talk and we will answer all your questions, we are all a team. Silicon Valley USA, Germany, Singapore, Japan, Canada and still deciding last one of this round for London or Australia. 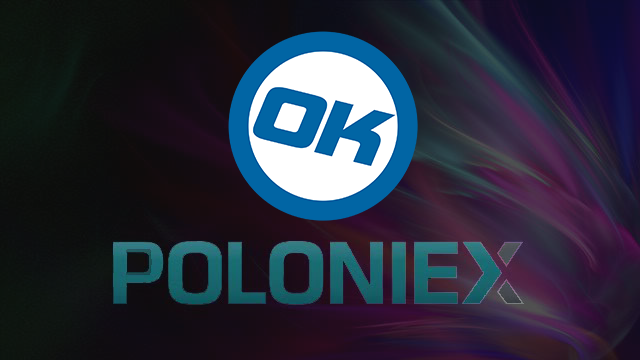 We are still waiting on Poloniex, we submitted the proper information and at this moment we are getting verified to comply with full transparency requirements, in the meantime, we have also sent information to other stock exchanges with info/requests about adding OkCash to their platform. You will receive detailed information over the next few days in the coming Updates. WITH DAY 07/09 -- We begin to work with the marketing group that will actively expand the OK reach. They will also be responsible for acquiring new contacts for cooperation with developers in the field of computer games. Much emphasis will also be placed on the micro-payment system, to properly use the potential of the Okcash cryptocurrency as a form of payment on more websites/services (eg stores). Organizing events / contests / tournaments, the first preparations are made before the official announcement. Details soon. The QR code on the necklace holds your Okcash address. You can deposit to it and/or share it to receive payments any time. Just tell them to scan it and send you your coins! We are in the process of creating different designs with QR code, T-shirts, caps etc. NEW OK WEBSITE FOR AND BY THE CHINESE COMMUNITY! Due to the growing interest in working with developers from different computer game environments, and continue with the OK evolution, we decided to do a Rebranding. Marketing and promotional campaigns in the world, with the main focus on Russia and Asia, will start under the design. Details and prototypes of upcoming changes will be revealed to you next week. We decided to expand our capabilities and enter Poloniex. However, before the full details and the specific date appear, we would like to invite you to a vote in which you support our decision. If at the end of the vote, 51% of the votes cast will be for Poloniex exchange entry -- we will update the date of entry. The voting is made by our friendly marketing group. As well, this tool can be used as a preview of the current result. We hope you will be pleasantly surprised by us soon. Due to the fact that we have provided a platform for voting / submitting your ideas. We will continually add different types of initiatives that, once expressed your interest, will come into effect. Among other things is OkCash's entrance to other stock exchanges. We also want you to participate in the OK development, and because we do it for you -- you can have a direct stake in it. 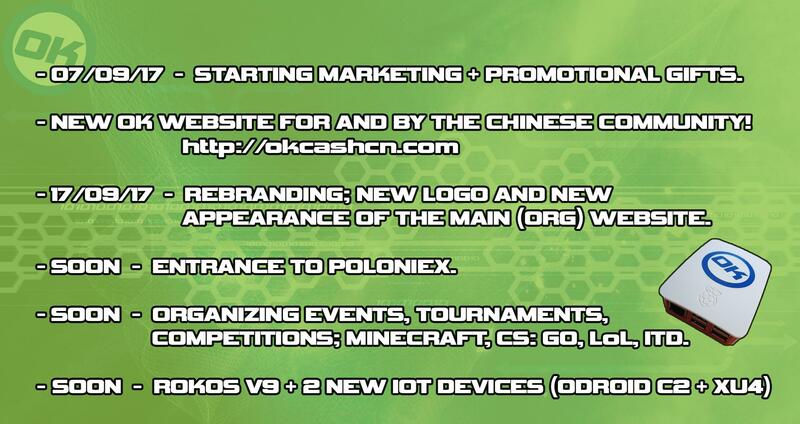 Due to the great interest in OkCash, we have been able to refine the terms of cooperation with a well-known youtuber, who will help promote the "okcash games exchange and projects". More specifically, we will also be supporting micro-payments in games. Full details will be updated on a regular basis. Many events, tournaments and competitions ahead! We have also built a large community of players from around the world who are eager to help us with organizational matters. Eventually we will host tournaments around the world. 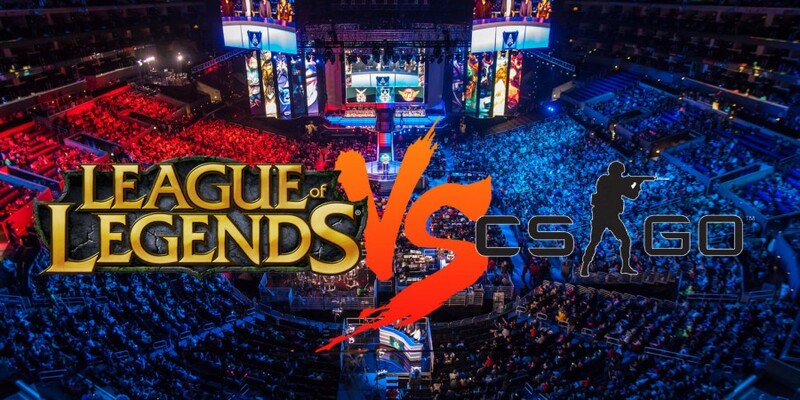 That is why we are in the process of establishing the terms of cooperation with the person who has a very strong gaming presence on Youtube. Live broadcasts of tournaments as well! Thanks for sharing the update + follow up as it ends up helping other users in the future.